Lovely shading with the brown robes. Just watch they don't drink too much of that ale. There's a thin line between merry monks and mad monks. Hello again, I have a historical question for you and as you are the master of all things ancient, I thought I'd get your advice. Many years ago, I downloaded and printed out your Roman website for designs etc and I need your help once more. I have bought some Ancient Germans recently and have been thinking of painting a warband or two. I also bought a pack of Angons to give them a little more Germanic feel. I know the Angon was a third Century weapon, but would it have existed in the 1st? There might have been a varient of it or something. I hope you can help. Many thanks, Simon. You'll definitely get your answer there! 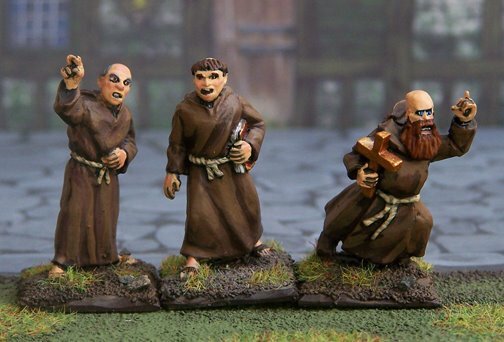 I like the look of your monks. I am a huge fan of the Brother Cadfael Mysteries and have been considering putting together a set of figures depicting those characters. 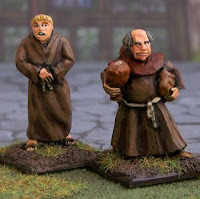 Any other characterful monks out there?